Metal cutting is alive and well in academia, with research producing both radical new technologies and clever tweaks for traditional machining. While your shop is busy making chips, professors and graduate students around the country are researching and experimenting with ways to make your jobs easier, faster, and more cost effective, and even make impossible parts possible to machine. Cutting fluids are expensive to buy, expensive to maintain, and then expensive to dispose of after their useful life is over. They can also cause skin sensitization, and you have to treat them to prevent anything from growing in them. Minimum quantity lubrication (MQL) offers a way around using large quantities of fluid, but MQL’s spray of lubricant doesn’t appreciably cool the tool. A new approach, developed at University of Michigan, uses carbon dioxide, but not in its familiar gaseous form. “When you take carbon dioxide and compress it and superheat it, it displays properties of both liquid and gas,” said Gordon Krauss, research investigator/adjunct lecturer at University of Michigan, Ann Arbor, Mich. This is known as the supercritical state, and it occurs for many materials at the right temperature and pressure. For carbon dioxide that means 31 degrees C (88 F) and 1100 psi, Krauss said. To create this process you would need to buy a pump system—that’s the critical aspect of the technology, Krauss said. It would require you to buy food-grade carbon dioxide and mix in a small amount of the appropriate lubricant. Then use a nozzle to spray the coolant at the machining area. The carbon dioxide cools as it expands, providing a cooling effect for the tool. At the same time, a small amount of the lubricant is applied. The project’s goal originally was to develop a cooling technology that was more environmentally friendly than conventional coolant, even if it meant a lower performance, Krauss said. He “set a grad student to work on it, hoping for it to be half as good,” he said, “and it turned out to be better.” The food-grade carbon dioxide used in the system is a by-product of ammonia production, Krauss said. It’s the same stuff that puts the bubbles in soft drinks. Carbon dioxide has a bad reputation as a greenhouse gas, contributing to warming the earth. However, taking into account the whole life cycle—coolant manufacture, usage, and disposal—the small amount of carbon dioxide this technology uses has a small environmental effect compared to that of conventional cutting fluids, according to a study published in the journal, Environmental Science & Technology. This technology is being commercialized by Fusion Coolant Systems, Ann Arbor, Mich.
TriboMAM control (background), tool, and chips. A technology developed by professors W. Dale Compton and S. Chandrasekar at Purdue University School of Industrial Engineering, West Lafayette, Ind., enables faster drilling, without peck cycles. Modulation assisted machining (MAM) oscillates a drill in a controlled motion, up to 1000 times per second. This produces an intermittent drilling action that cuts consistently small chips, which easily flush from the hole. It also enhances lubrication. M4 Sciences, West Lafayette, Ind., is commercializing this technology in its precision TriboMAM drilling system and custom modulation-assisted machining devices. Chips are also on the research agenda at University of North Carolina Charlotte (UNCC), Charlotte, N.C. You can use a lot of different strategies to deal with them, said UNCC professor Scott Smith. High-pressure coolant and tool geometry come to mind. His department is working on using the axes of the machine to change the tool path and control movement of the tool entering and leaving the cut, thereby controlling the geometry of the chips. You can break all chips in all materials, Smith said, by modulating the tool path. This same strategy can aid in machining difficult materials like nickel alloys. UNCC has a long history of making really thin parts by machining—parts that used to be made in sheet metal, Smith said. With lots of applications in aerospace, big reductions in cost and weight were possible. In sheet metal, the cost was not in the material but in the hand work: folding, riveting, sealing layers to put a rivet through. The focus on machining thin parts has been going on for more than a decade, he said. “Since the early 1990s, we’ve been asking ‘How are we going to make this oncoming slew of micro parts?’” said J. Rhett Mayor, professor at Georgia Institute of Technology, Atlanta, Ga. Research includes looking at fast, accurate machining, hard-to-cut materials, and micro-scale mechanical machining processes. Conventional machining goes down to tool sizes of 1 mm or 1/16”. Meso (intermediate) machining includes work with tools smaller than 1 mm or cutting features under 1 mm. Micro machining has many definitions, some of which would include the meso range. In practice, however, said Shreyes N. Melkote, PhD, also a professor at Georgia Tech, machining features below 500 microns (about 0.020”) qualifies as micro machining. “Job shops call me and ask, ‘How can we get into the [micro machining] market? How can we participate?’” Mayor said. “It’s often as simple as buying better spindles and taking a short course. People with a smaller conventional robust 3-axis machine—maybe Haas or Okuma—will come in and ask, ‘Could I make a meso scale component with some micro features?’” For example, some shops may be making biomedical parts that are not that small, but the surface required to allow proper tissue growth may be in the micro realm—you now have to make micro surface features. On the micro level, many aspects of machining change, becoming more difficult or just different. 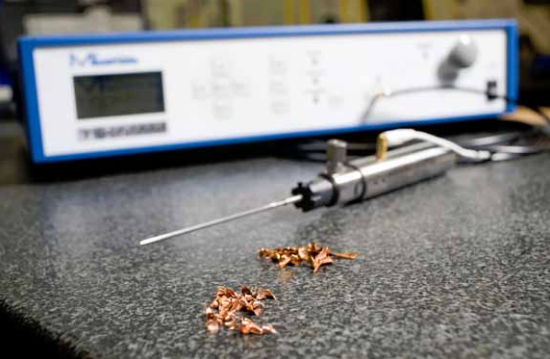 Melkote has worked to develop methods to set tools 100 microns (0.004”) in diameter. You can’t use paper, which is about 100 microns thick, to set a 100-micron tool. Automatically detecting when the tool contacts the workpiece will aid setting. Tool holding becomes a challenge when just tightening a chuck can break a 100-micron tool. Work is being done on lubrication and cooling at the micro level, Melkote said. “If you take a normal coolant nozzle and blast it on a 0.004” tool you can break it.” New coolant schemes will provide laminar (smooth) flow around the tool. Georgia Tech is developing a new approach for enhancing the productivity of making large parts made of hard materials, Melkote said. For example, bearing rings for wind turbines present particular challenges. They’re made from hard materials and run two to three meters in diameter. They take six to 10 hours of grinding or hard turning, using cubic boron nitride (CBN) tools. On a smaller scale, his department is working with one of the leading bearing manufacturers, allowing them to speed up the machining process and use lower-cost tools, such as aluminum oxide ceramic. 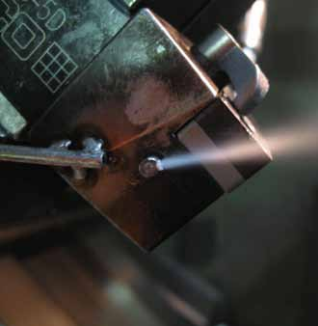 In laser-assisted machining of hard materials (perhaps in excess of 60 Rockwell C) a laser is used to treat the surface before machining. To incorporate a high-powered laser right on the spindle is unwieldy, so the process uses the laser outside the machine tool to essentially temper the surface of the workpiece a few millimeters deep. Then the part can be cut at conventional speeds, or even faster, reducing the overall processing time. Some of the current research may seem like science fiction, but probably carbide tools and CNC machines did, too, when they were being developed. Many of the far-out ideas in university labs today will eventually find their way into your shop to make your work life easier and your profits higher.